Dit pakket bestaat uit 25 ml pre peel oplossing, 50 ml fruitzuur en 25 ml post peel oplossing. De sterkte van het fruitzuur kunt u zelf kiezen in de scrolbar hieronder. Door middel van een oppervlakkige peeling (zoals een glycolzuurpeeling) kunnen we op een veilige en gecontroleerde manier de laag met de beschadigde huidcellen verwijderen. Hierdoor wordt de 'gezonde huid' weer zichtbaar en kan uw huid weer stralen. Met het ouder worden gaat de kwaliteit van de huid achteruit. Zon, roken, stress en hormonale veranderingen doen hier nog een schepje bovenop. De huid, die is opgebouwd uit miljoenen cellen, kan steeds moeilijker haar dode of beschadigde huidcellen kwijtraken en vervangen door gezonde nieuwe huidcellen. Het resultaat is een vale, grauwe en vlekkerige huid. Is er geen sprake van een actieve acne maar wel van een vette, onrustige huid, ook dan kan een oppervlakkige peeling (en in sommige gevallen een iets diepere peeling) de huid rustiger en gladder maken. Glycolzuur heeft een positieve invloed op huidveroudering. De conditie van de huid zal verbeteren en de huid zal beter vocht vasthouden na een peeling met glycolzuur. - Gentle Post Peel Neutralizer (25 ml) - Quickly neutralizers the peel, rebalancing the natural pH of the skin. This Glycolic Acid Peel Kit contains a pure grade of Glycolic Acid of pharmaceutical grade. Glycolic acid and pure distilled water as the only ingredients. There are no chemical preservatives or additives. This solution is to be used before applying your the skin peel. The pre peel solution performs a skin cleansing and hence gives a more effective skin peeling. A quick drying formula which effectively removes skin residue and natural oils from the skin prior to a chemical peel treatment. The pre peel solution lowers the pH level of the skin for optimal peel penetration and optimal results. Improving skin peel results with acids that are not as oil soluble. This solution is to be used after applying the skin peel. The neutralizer solution stops the exfoliation process and restores the normal pH balance of the skin. The neutralizer also soothes and cools the skin after the peel. First Timers - It is advised for first time users to begin with a lower strength (10%-20%) Glycolic Acid treatment. Initially cleanse the skin with a suitable cleanser / toner. Take a cotton pad and dampen with the solution. Apply the damp cotton pad to a small area of the cheek and wait 1-2 minutes, and then wash with plenty of warm water to remove the peel. Then access your skin tolerance for this % of Glycolic Acid skin peel. There should be no redness, burning or formation of blisters during the treatment. If this is the case discontinue use as your skin type is too sensitive for the Glycolic Acid peel treatment. But, the skin can turn light pink during the peel process, after 48hrs the skin colour will return to normal. General Procedure – Wipe a dampened cotton pad over the face with 10-50% Glycolic Acid Skin Peel. Leave for 2 mins then wash off with plenty of warm water. Repeat every week increasing the time period of the peel on the face by 1 min each time for a period of 6 weeks in total. After the 6 weeks it is advised to allow the skin to rejuvenate for at least 2 weeks before beginning a further treatment regime. After each treatment use moisturizer to ensure the skin does not dry out. During sunny weather wear the appropriate sun screen to protect the newly exposed skin cells (SPF15 is recommended). During the treatment phase the skin will peel and appear flaky after 1-2 days after treatment. This is a part of the treatment removing the dead skin cells. Apply the pre peel solution to a cotton pad and apply in a circular motion to the area to be peeled. Wait 5 mins and the apply your peeling product as normal. Apply the Neutralizer solution to a cotton pad and apply in a circular motion to the area which has been peeled. The peel will be neutralized. Leave for 5 mins and then wash off with plenty of water. 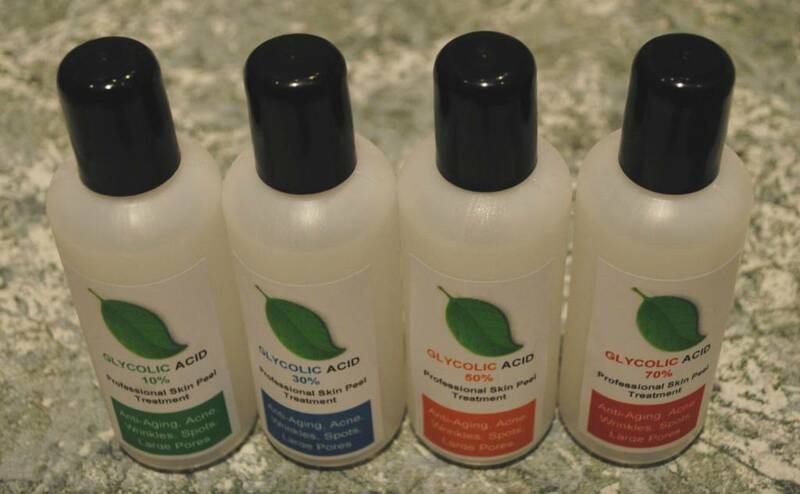 The AHA Glycolic Acid Skin Peel 100ml Kit treatment will be supplied in a 50ml HDPE heavy duty bottle for the glycolic acid peel and 25ml HDPE bottles for the pre peel and neutralizer and sent in a strong jiffy bag. Glycolic Acid should not be used when the skin is broken, inflamed or damaged (cuts and grazes).